There’s good reason why an estimated 79 million U.S. households own at least one pet: They provide their owners with years of companionship and unconditional love. However, pets — even small ones like fish — have even more positive benefits for young children. How can your child flourish from having a small pet? Let us count the ways. The main reason parents get their child pets like birds, fish and gerbils is to teach them responsibility. Small animals are perfect “learning” pets for children because most of them don’t require a lot of attention, food or exercise. The sense of responsibility kids get from taking care of their pet birds, reptiles or fish often transfers to other parts of their lives — they take better care of themselves and oftentimes get better grades in school. “I often witness positive attitudinal changes in young people following the introduction of animals to their lives,” Elizabeth Omerod, a companion animal veterinary surgeon in London, told EverydayHealth.com. Children are known for playing hard — and their destroyed toys show it. 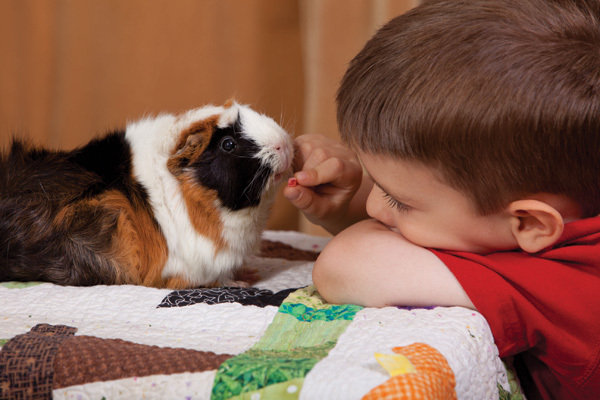 However, small pets must be handled with care, so kids quickly learn the importance of gentle treatment and it translates to other facets of their lives like their relationships with their siblings and friends. “Children trained to extend justice, kindness and mercy to animals become more just, kind and considerate in their relations to each other. Character training along these lines will result in men and women of broader sympathies — more humane, more law-abiding and in every respect more valuable citizens,” the National PTA Congress writes of the correlation between pet ownership and child empathy. Plus, kids who are kind to animals are less likely to get in trouble with the law: One of the biggest indicators of future violence in children is cruelty to animals. Many kids have allergies to certain animals, but owning a pet — even small ones — has actually shown to improve health over time. Need proof? A recent large-scale survey of over 11,000 Chinese, Australian and German people found that pet owners made significantly fewer visits to the doctor than non-pet owners. Pets can even improve allergy symptoms in children when they’re introduced to animals early in life, according to Andrew Weil, M.D..
Pets — even small pets like fish and birds — can bring incredible stress relief to your little munchkins. Think about it: Pets don’t care whether or not you’ve had a bad day — they just want to be there for your when you get home. Kids have far too many challenges in today’s society — both academically and socially — and their small pets can give them a semblance of normalcy and balance even when life challenges them. “Petting an animal, hearing its soft breathing, feeling its heartbeat, looking into its sweet eyes, knowing that the pet needs us and that we need the pet creates feelings of love and a corresponding influx of chemicals from the brain that are calming and comforting and create a sense of well-being and happiness,” Caryn Sabes Hacker, psychotherapist and author, told EverydayHealth.com. Why else are pets good for kids? Share in the comments below!